Time to throw in your votes for YOUR skateboarder of the year. Last year Guy Mariano easily took the award plus a few other trophies. This year will definitely go to someone else; who it will be is still a mystery. Could it be Heath Kirchart with his ever amazing ending part in Alien Workshops Mind Field video? Or possibly Greg Lutzka who threw down a 3 peat at Tampa Pro. Lizard King got tons of coverage this year and I wouldn’t be surprised to see him get a reader’s choice. Chaz Ortiz pulled off one of the biggest sponsorship deals in the history of skateboarding by acquiring Gatorade to his list of backers. That and he managed to win a contest against the usual Dew Tour suspects. Could it even go to an unsung hero? The out come is in your hands. Actually, why not just pick someone random who hasn’t gotten much coverage and give him some glory. That would be awesome. Ronnie Creager wasn’t really too much in the limelight this past year but I guarantee his new Blind video part will be a reminder to all that he’s a technical wizard. That and I feel like already giving him an award just for being himself. I don’t even need to see his video part yet to know it’s going to be good. Man its going to be a tough reader’s choice selection this year. 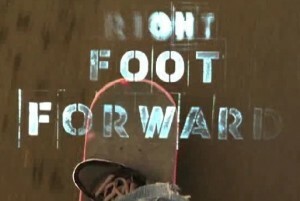 Right Foot Forward is the title for the latest Transworld Skateboarding video. Is it coincidence that the skateboarders featured in it all skate goofy? I think not. Watch the trailer and prepare to be stunned. The editing is top notch and the skate trailer alone makes you feel as if you were prepping for a full length motion picture. Transworld never disappoints when it comes to their skateboarding videos and you can already tell that this one is no different. The list of featured skateboarders also promises a good video. Joey Brezinski is going to bring the tech tricks to the table. Corey Duffel’s going to bring the gnar. Bobby Worrest ollieing a 21 stair? I heard rumors. Kellen James will grind the hell out of everything with finesse. And Matt Beach! Yes Matt Beach is back. I haven’t seen a part from him since “Can’t stop the Firm”. Really looking forward to it. Overall the video already sounds like a hit and I can’t wait to check it out! Seriously I really like the artistic direction skateboarding videos have been going a lot lately. Good filming, amazing editing, and quality that looks superb. The future looks bright! Transworld Skateboarding recently held a nine day contest with four of the top teams in skateboarding; DVS, Osiris, Emerica, and Globe. Each team assembled their top five riders together inside a private warehouse in Vista, CA where they had to create skateboarding obstacles under a certain budget. They had full creative control of their own project but had to obtain photos and video footage of it all and turn it in on the due date. DVS took the 1st place honors, thus the Daewon Song cover on the new Transworld Skateboarding issue. You really have to see all four of the team’s videos though, each team has its own unique style and theme set to their own projects. Every video is amazing in its own way, check them out and decide for yourself which is your favorite. Sometimes I’m amazed at what they were pulling off in some of the trippy lighted or low lighted areas. I would think it would add that much more difficulty to trying to pull off anything on some to those obstacles. Most notably for me, Chris Haslam’s wall rides to rail grinds near the end of the Globe video. You’ll see what I mean; honestly Chris Haslam and Daewon Song are freaking machines. How they do some of the things they do beats me. In my opinion DVS’, and Globe’s videos were the most well put together. But Osiris’s concept and John Rattray’s fire ring stunt were off the hook and original. Last but not least, Emerica’s interpretation was trippy and definitely something I haven’t seen before either. Skate and Create is honestly one of the most unique contests I’ve ever witnessed. I’ve never seen anything like this done before and it was a spectacular and creative idea. I truly can’t wait to see who next year’s teams will be and what the outcome will be. The skateboarding was incredibly top notch as well. Check it all out for yourself. I guarantee you will dig it. Transworld skateboarding videos have influenced me and my skateboarding since as far back as I can remember. Not only in the way I try to skate, but also in the way I film, and edit skateboarding videos. Some of the greatest skateboarding videos of all time have come from the Transworld Skateboarding vault and this newest installment is yet another amazing gem. “AND NOW” is the newest TWS video title and may I say that it is very well fit. Think of this video as a new age “IN BLOOM” which launched the careers of many of the pros you see today. 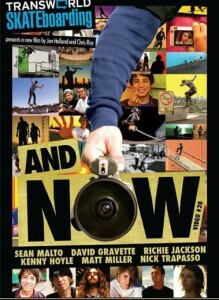 Sean Malto, Nick Trapasso, Matt Miller, Richie Jackson, Kenny Hoyle, and David Gravette all have full length parts in “AND NOW”. I watched this video at the Transworld Skateboarding awards and I was blown away. First off, they had a super good selection of music flowing throughout the video. Richie Jackson’s part will have you rewinding your DVD player numerous times. David Gravette will leave your jaw dropped with his ridiculous hammers and Nick Trapasso’s laid back style will leave you stoked and entertain you tremendously. Matt Miller and Kenny Hoyle will be household names without a doubt and we all know who Sean Malto is! This lineup of skateboarders is basically a dream team of Am’s and in my book, up there with the greatest of Transworld Skateboarding videos. Yup, that’s right, I favor this one as much as I do with Sight Unseen, I.E., Modus Operandi, and The Reason. It’s that good, no joke. If you are lucky enough to have a video premier date somewhere close to you be sure to check this video out. As for me, I will definitely be one of the first in line to get a copy of this masterpiece. I can’t wait to find out what the next lineup of shredders is for the newest video in the works. I can only imagine.